Last month we took some time to focus our attention on groomsman gifts. So this month we thought it fitting to switch sides and offer some suggestions on gifts for the girls, we’re talking bridesmaids gifts. Today we want to share our picks for stunning gifts that will say thank you to the most important women in your life. We know they will love me as much as we do! These cute tumblers make the perfect bridesmaids gift. 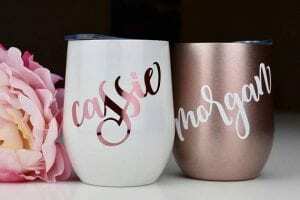 Give it them to your girls the morning of the wedding and they can spend their time getting ready drinking wine in style. They come in a host of different colors including the current on trend look of rose gold. And you can customize them with names or monograms. Plus your girls will love to use these for years to come so you know they will be a hit! 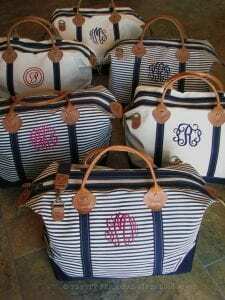 These cute bags would be the perfect items for your bridesmaids to use for your wedding. Give them to them the night of the rehearsal dinner and they can pack all the essentials they need to look perfect on wedding day. They in come in host of great colors and you can further customize with thread to added monograms and other personalization. Plus your grateful friends will think of you each time the pack this cute bag up for a quick weekend getaway in the future. Looking for something a little more classic, than this pearl necklace with initial charm is the perfect option. It comes in sweet gift box that offers a thank you for being there during your special day. It simple look is understated and perfect to fit all of your bridesmaids taste! These are just a few of the amazing options we found on Etsy. They have a whole host of options that are sure to fit your style. Check them out to find the perfect gift that says thank you to all the lovely ladies in your life! Want more help with all the little details? Contact Magnificent Moments Weddings, we would love to help you with any item for your wedding big or small.